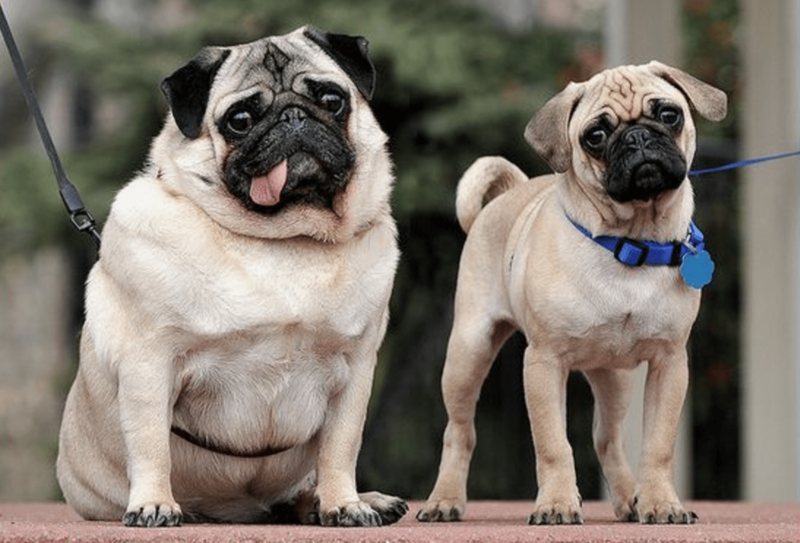 This weekend hits peak outdoor Shakespeare, plus: outdoor pug grumbles and pow wows; comedy in new venues; luchadors, Taiko drummers, Fake Prom scream queens, and more. Titania (Michelle Polak) and Bottom (Nikki Duval) beneath a full moon in Shakespeare in the Ruff’s A Midsummer Night’s Dream. Photo by Dahlia Katz. The monthly leaderless bike ride, Critical Mass, meets this afternoon at the corner of Bloor and Spadina, before leaving on an unplanned route through the city’s core. New this month (as far as we know): there’ll be impromptu and pay what you can tune-ups offered for an hour before the scheduled departure time. Matt Cohen Park (393 Bloor Street West), meet (and PWYC tune-ups) 5-6 p.m., ride departs 6 p.m., FREE. Toronto’s best known outdoor Shakespeare experience, Canadian Stage’s Shakespeare in High Park (which this year features women in the title role of King Lear and the role of Feste in Twelfth Night), has some east end competition this weekend (and beyond), that also features some gender reversed and queer-positive casting. Scrappy local company Dauntless City Theatre stages their Two Gentlewomen of Verona throughout the recently reopened Berczy Park, moving the action all around the already popular ceramic dog fountain and busy thoroughfare. The audience, whose numbers steadily grow as curious onlookers join, is gently encouraged from scene to scene by a roving band of plastic tube percussionists (the “off-scene” company members) playing music arranged by David Kingsmill. There’s a live dog, too: Crab (played by Starbuck), who gamely trots (or is occasionally carried) alongside her master, Launce (Leslie McBay), herself a servant to Proteus (Jesselle Laurén). It’s Proteus’s arrival in Milan that kicks off a spate of romantic intrigues, as she covertly schemes against her guileless friend Valentine (Naya Guzman) for the affections of Silvio (Jordy Kieto), despite having a lover, Julian (Jordi O’Dael, whose identifying pronoun is they/them in both the show and program), who follows Proteus in disguise. 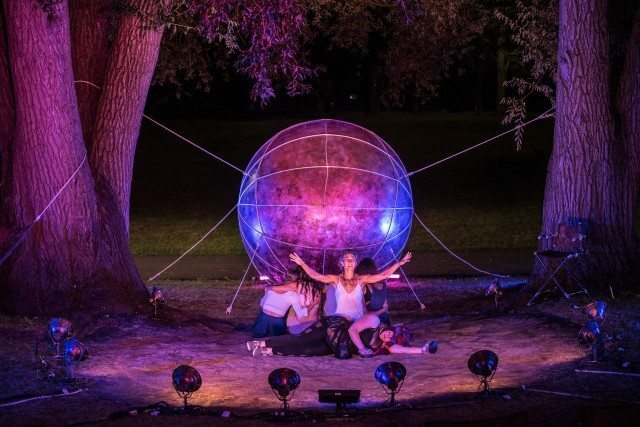 It’s all staged smoothly in the round by Scott Emerson Moyle, who directed and adapted the show, and the dozen-member (plus dog) ensemble coped ably with the many distractions in the park, from haunted walk tours to loudly oblivious tourists. Shakespeare in the Ruff’s A Midsummer Night’s Dream takes place in a more bucolic park setting, in the middle of Withrow Park, between two large oak trees; they’re back to their original location after last year’s Romeo and Juliet was staged further south in the park. The glowing orb motif used in that show carries over to Dream, with the stage area dominated by a huge moon, and the spells that Oberon (Andrew Joseph Richardson) gives Puck (Tim Welham) to cast on Bottom (a delightfully buffoonish Nikki Duval) and Lysandra (Joella Crichton) made visible as handheld balls. The lovers—Hermia (Jonelle Gunderson), Demetrius (Danny Ghantous), Helena (Eva Barrie), and Lysander—have physical flourishes (choreographed by Patricia Allison) that lend a bit more poetry to the proceedings; they also need to be quite fit, as “backstage” is, for the most part, in a full-view sprint to surrounding trees. A community choir also adds a bit of magic to the night scene, as does that giant moon, especially when the lovers become “rude mechanicals” to stage Pyramus and Thisbe for King Theseus (Richardson) and Queen Hippolyta (Michelle Polak). Two Gentlewomen of Verona runs to August 27, Berczy Park (Front and Church streets), Friday-Saturday, 7:30 p.m., Saturday-Sunday, 1:30 p.m., PWYC. A Midsummer Night’s Dream runs to September 3, Withrow Park (725 Logan Avenue), Tuesday-Sunday, 8 p.m., PWYC. Toronto-based filmmaker Pavan Moondi’s new feature film, Sundowners, is his most ambitious to date, and features an eclectic cast of artists better known as musicians and comics, including Nick Thorburn (Islands), Nick Flanagan, Cara Gee (The Expanse, Strange Empire), and more. Two slackers (Born Ruffians’ Luke Lalonde, and comic Phil Hanley) are pressured into a wedding photography gig at a luxurious Mexico resort, and find themselves in a series of misadventures. Tonight’s opening at TIFF will feature Moondi and cast members Hanley and Jackie Pirico answering questions post-screening—plus, tickets for tonight’s premiere screening will get you into the opening party. TIFF Bell Lightbox (350 King Street West), 7 p.m., $10-$14. The theme for this year’s Fake Prom is “Curse Of The Fake Prom,” a mash-up of classic horror films. Surprisingly, there are still a few tickets left—and though we wouldn’t recommend crashing the door, there’s a block of tickets for those who live dangerously. Palais Royale (1601 Lake Shore West), 9 p.m., $20. 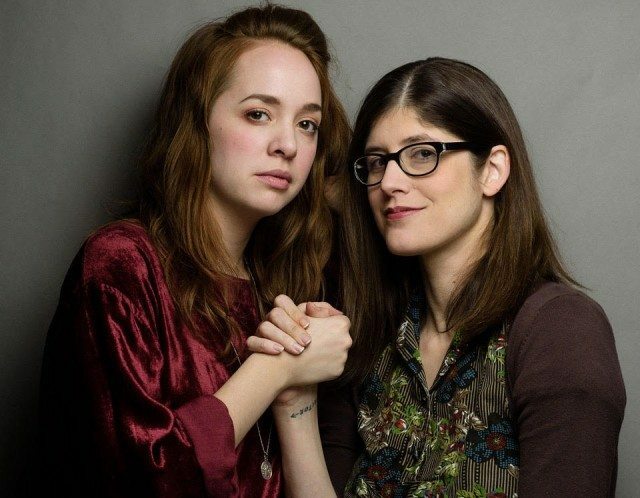 The Sufferettes (Kayla Lorette and Becky Johnson) appear today at the Bloorcourt Street Fair, and tonight on the Canada’s Finest comedy showcase. Photo by Kristina Laukkanen. The one-day Bloorcourt Arts and Crafts Street Fair, which will shut down Bloor today from the western edge of Christie Pits to Dufferin Street, has a few interesting programming notes over and above the typical street cuisine and corner music performances. A “hurly burly” of performances showcasing the Bloorcourt Village’s past and present history of cultural performance includes theatrical installations by the Red One Theatre Collective and the Sufferettes (doing a “seance“), talks on the area’s film history at the Bloor/Gladstone Library, and more. Bloor Street from Montrose Avenue to Dufferin Street, noon-10 p.m., FREE. The Ma-Ne-Res Pow Wow at Fort York in 2016. Photo by Harvey K via Torontoist’s Flickr Pool. 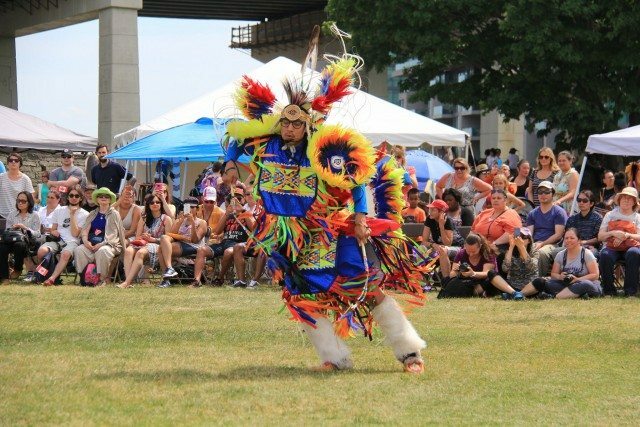 The first annual Council Fire Youth Pow Wow and will feature guest dancers, a council fire, and closing ceremonies (opening ceremony at noon, closing ceremonies at 5 p.m.), and has a stated objection of “Restoration of Identity” for Indigenous Torontonians, both young and old. There’ll also be men and women’s dance specials, and a coming out ceremony. Regent Park (600 Dundas Street East), noon, FREE. Toronto Taiko Festival 2017 promo from RAW on Vimeo. The Bang On! Taiko Festival Concert is a culmination of the week’s workshops as part of the Toronto Taiko Festival, featuring five drumming acts (including Toronto’s Raging Asian Women Taiko Drummers), plus special guests from the festival’s programming. MacMillan Theatre (80 Queen’s Park), 8 p.m., $15-$25. Monthly comedic showcase series Canada’s Finest has a exceptional bill tonight, including The Sufferettes (fresh from the Bloorcourt seances), Fraser Young, and Mark Little. Comedy Bar (945 Bloor Street West), 9 p.m., $15. Image courtesy of Lucha TO. Photo by Sarah K. Andrew via Pinterest. Much fun, snorting, and frolicking will be observed today at the August Toronto Pub Grumble, as the breed’s fans gather with their pets to watch them mingle. Trinity Bellwoods Dog Bowl, 2 p.m., FREE. The Battle Rock: Lucha Libre Rock Concert mashes up lucha libre wrestling, cabaret performance, and rock music, so it’s appropriately being presented at Lee’s Palace. Special guests include U.K. wrestler Grado and Mexican “exotico” Cassandro. Lee’s Palace (529 Bloor Street West), 5 p.m., $20. Punchlines In The Paint is a new comedy showcase presented by the Talkhole Podcast Network and Side Launch Brewing Company, launching with some choice headliners tonight, including Dom Paré, Courtney Gilmour (recent co-winner of the JFL Homegrown award), and Albertan stand-up Scott Belford, plus a few “surprise” guest comics. In The Paint (147 Spadina Avenue), 8 p.m., FREE. Comedy duo 2-MAN NO-SHOW reunites tonight at Party Hard Hard Party. Detail of an image by Gautam Narang and Kurt Firla. 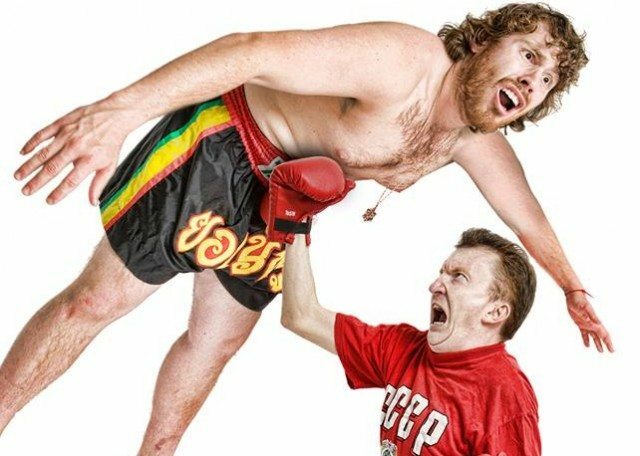 Two improv duos launched the Party Hard Hard Party comedy show: RN and Cawls (Rob Norman and Adam Cawley), and 2-MAN NO-SHOW (Ken Hall and Isaac Kessler). But with Kessler and Hall (TBS’ People of Earth) both spending the majority of their past year in L.A., the show hasn’t had all four founding parties present for a while. So tonight’s a reunion, with a half-dozen other improvisers, including Stacey McGunnigle and Christian Smith, also partying hard. Bad Dog Theatre (875 Bloor Street West), 9:30 p.m., $10. 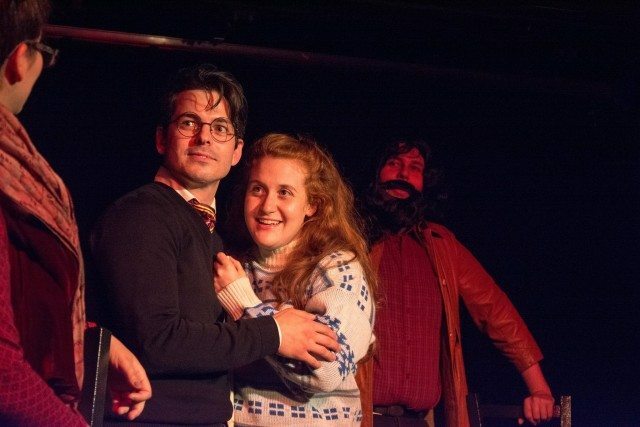 Actor-improvisers Oliver Georgiou and Liz Johnston’s SODA Underground series appears at #Hashtag Gallery tonight. Photo by Olivia Lecomte. What’s an art gallery for? Besides installations and wall displays, maybe some performance, too? That’s the intent of SODA Underground, an intimate and improvised theatrical show that takes place in the basement of #Hashtag Gallery. The cast this month includes Kat Letwin and Jamie Cavanagh, who closed VideoCabaret’s Confederation Part 1 and Part 2 last weekend, plus musical accompaniment by SIDEMAN (Justis Krar and Ross Miller). #Hashtag Gallery (830 Dundas Street West), doors at 7:30 p.m., show at 8 p.m., $10. 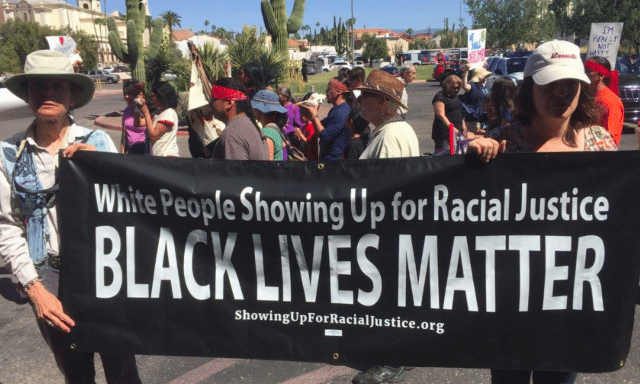 Showing Up For Racial Justice Toronto is an especially topical advocacy group, given recent international events: it’s a group formed to combat white supremacy, asking primarily white people to organize and lend support to existing racialized advocacy movements. The SURJ Toronto Open Meeting #4 is essentially an info session: for potential new members, for existing supporters, and the simply curious, to spell out the group’s core tenets and to discuss ongoing work. Church of St. Stephen In-The-Fields (365 College Street), 6:30 p.m., FREE. As far as they know, they’re the first: Boston-based sketch troupe Asperger’s Are Us is the only comedy act whose members all fall on the autism spectrum. They’re making their Toronto debut tonight; while they want to be clear that the event is a comedy show, not an awareness tour, there is a Q-and-A post-performance for patrons curious about their comedic process. Social Capital Theatre (154 Danforth Avenue, 2nd floor), 8 p.m., $10.